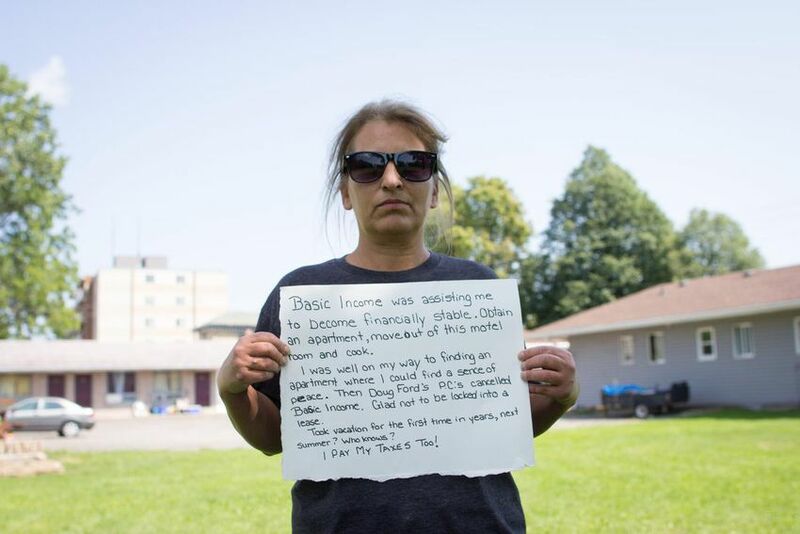 Jessie Golem wants to put a face on some of the 4,000 Ontarians whose hopes for a better life have been dashed by the Ford government’s cancellation of the Ontario basic income pilot project. 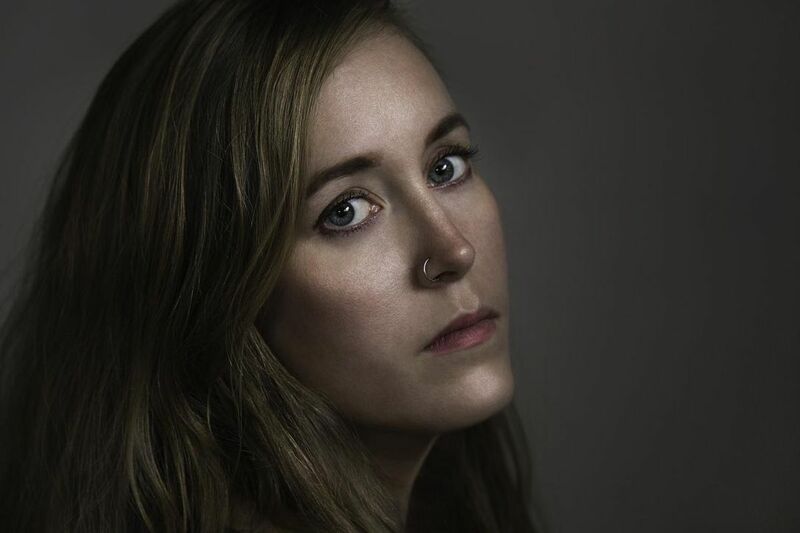 For the Hamilton photographer, her latest photo series is deeply personal: she was among those participating in the program, initiated by the previous Liberal government before it was cancelled by Progressive Conservative Premier Doug Ford. “I was furious, obviously, and devastated to hear that the Conservative government broke their election promise and lied and prematurely cancelled the pilot without any justifiable reason whatsoever. They’re not even able to cite any sort of sources or data to justify why they were cancelling this,” Golem said. The pilot program — aimed at helping people escape from the treadmill of social assistance — was available to residents in Thunder Bay, Hamilton, Brantford and Lindsay, giving $16,989 annually for a single person and $24,027 for a couple, with a 50 per cent clawback for any earned income. “For me personally, it affects my survival. I was depending on that money. I had previously been working up to four jobs and exhausted and non-stop working and … just barely managing to scrape by. It was an extremely frustrating existence,” Golem said. The Ford government cancelled the program in July, despite promising to keep it alive during the recent provincial election campaign. The three-year project began in April 2017. A group of citizens in Lindsay are slated to hold a news conference Monday to announce a legal challenge to the Ford government’s decision to end the program. Golem, a freelance photographer and member of Photographers Without Borders, decided to use her skills to document people like her who have had their hopes shattered. “It’s not just me, there’s 3,999 other people who are directly affected by this and they have stories, too. They’ve been using Basic Income to go back to school or start businesses or move into safer living or get themselves out of poverty. I keep on hearing these stories and honestly, it’s the most heartbreaking photo series that I have ever done,” Golem said. 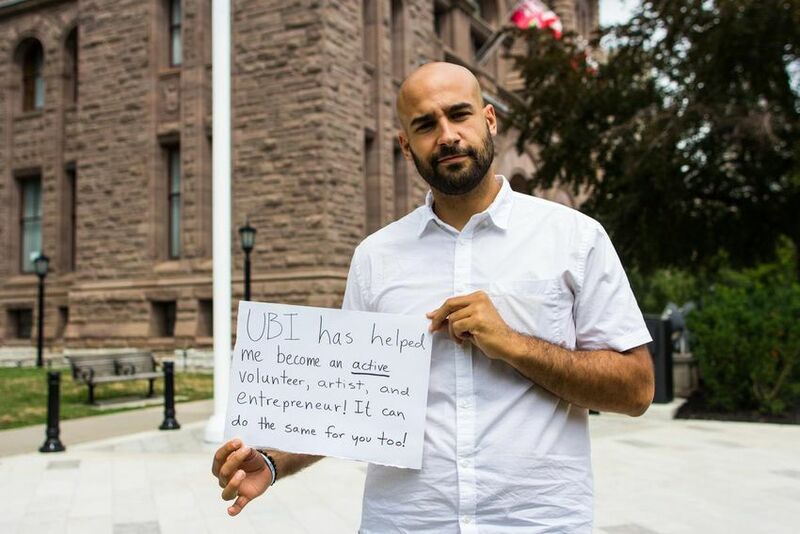 The project is called Humans of Basic Income. Golem had initially planned for a 30-photograph series of participants holding up a small cardboard sign describing their personal plights. She’s since decided to expand that number — she’s heading to Thunder Bay soon to gather more — and is now aiming for 100 photos. Laurel Knight, 50, of Brantford, said she has lived in a motel room for several years, working in a coffee shop where her hours are reduced during the summer. She came close to renting an apartment, but is glad she didn’t because she’d be locked into a lease she can’t afford. With the pilot program, “I got all my immediate bills taken care of. This year, I took some vacation days, whereas normally I wouldn’t be able to do that. I was able to buy an unlimited bus pass. That was a big thing,” Knight said. James Collura, 28, of Ancaster, called the pilot project’s cancellation “extremely disappointing,” noting he was using the Basic Income program to rent work space to start his own business, while holding down another job. “The Basic Income pilot allowed me to have the psychological and financial freedom to explore where I could be the most effective in society. I wasn’t using it to survive, I was using it to thrive,” said Collura, who expects to open his business in the near future. “It (the pilot) is an investment in people. If we combine something like Basic Income with an education … I think people can really start to live their potential rather than living paycheque to paycheque,” Collura added. Golem is promoting the photo project through a Facebook and Twitter account, using the hashtag #humansofbasicincome, with more than 22,000 views on one post, Golem said. And while she said she accepts that people have legitimate objections to the pilot project, she said cancelling it partway into its three-year mandate means valuable data of possible solutions to reducing poverty is being lost and the money spent so far wasted. “I’m just saying, see the pilot through to the end,” Golem said. “All these stories are coming forward and (people) are saying, ‘I had so much hope and I was promised so much and I was going to do all this and now it’s gone.’ These stories are heartbreaking, but I’m glad I’m able to give people a voice,” she added. This entry was posted on Monday, August 27th, 2018 at 12:49 pm and is filed under Social Security Debates. You can follow any responses to this entry through the RSS 2.0 feed. You can leave a response, or trackback from your own site.